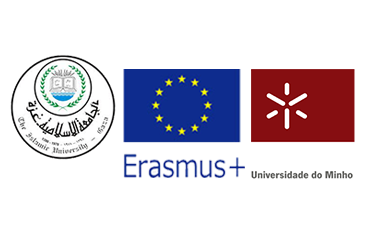 The External Relations Department at the Islamic University of Gaza (IUG) announces the availability of International Credit Mobility Opportunities for IUG Bachelor and Master students with University of Minho at Portugal under the EU-funded Erasmus Plus Programme - International Credit Mobility Project. 1. The applicant should be currently a regular student. 2. The CGPA of the applicant should not be less than 85% at the date of his/her application. · TOFFEL with minimum score of 470. - If the applicant cannot provide any, he/she should take English Language level test in the Deanship of Community Services and Continuing Education, and his/her score should be 9 at least. 4. For Bachelor Students: The applicant should have successfully completed 35 credit hours at least, and his/her remaining hours should not be less than 30. 5. For MA Students: The applicant should have successfully completed 6 credit hours at least, and his/her remaining hours should not be less than 9, excluding the credit hours of complimentary dissertation. How to Apply for the Project UMOVE(ME)? 8. Proposed Learning Agreement: preliminary study plan to be developed at the host institution (available at https://goo.gl/dJ12zf ), duly signed by the Academic Coordinator of the relevant Department. Note: The beginning of the mobilities will be February 2018 or September 2018. If you are interested, and all the eligibility criteria are applicable, please fill in the application here.